LikeSo is a mobile app that provides a real-time analysis of your speech fitness — kind of like a Fitbit for how you talk. And there’s an app to help with that. 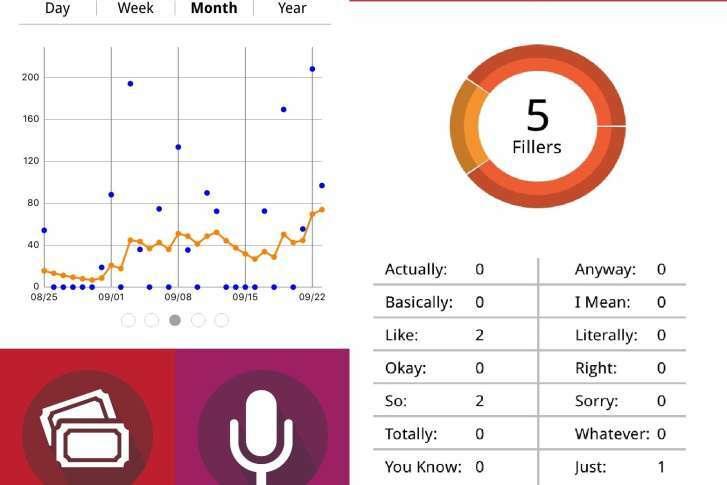 LikeSo is a mobile app that listens to you speak, and counts how many times you use annoying, unnecessary filler words. “Words like, ‘like,’ ‘you know,’ ‘whatever,’ ‘totally,’ ‘I mean,’ ‘right’ — they are fine to use once in a while, but when they get excessive they become distracting, and get in the way of sounding perhaps as confident as you want to sound,” LikeSo app creator Audrey Mann Cronin told WTOP. The overuse of the word “like” itself has become almost epidemic in American speech. The LikeSo app uses voice recognition to monitor how often you use filler words in a couple of different ways. There is a FreeStyle mode, which just listens and counts, and a TalkAbout mode, a conversation game that lets you practice speaking. It provides a real-time analysis of your speech fitness — kind of like a Fitbit for how you talk. “Just like any fitness tracker, it gives you results and lets you see how you’re doing over the day, month or year. And as we know, practice makes progress,” Mann Cronin said. Mann Cronin, a marketing and social media consultant, said there is no real evidence that using filler words is more of a male or female thing, although they are clearly a crutch more likely used by younger people. The app also tracks how fast you talk. The perfect speed, according to Mann Cronin, is about 150 words per minute.